Taking it to the Streets: How good is your Mailing List? Taking it to the Street: How good is your Mailing List? If you’re a regular reader of Printer Press, you know we strongly believe in the power of direct mail marketing as a way to build business. Keeping your company or organization’s name in front of customers helps to reinforce their decision to use your products and services; for prospects, it creates name recognition; and for both groups it builds top of mind awareness for your brand. 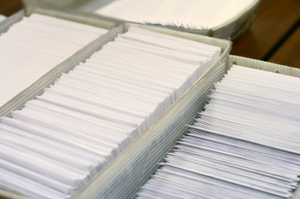 The success of any direct mail marketing campaign is determined by three factors: the quality of the mail piece itself; the offer; and the mailing list. Of these, the mailing list is significantly more important than the other two. In fact, the Direct Marketing Association attributes 60% of the success of a mailing to the list itself and just 20% each to the mailer and the offer. The secret to an effective mailing list can be stated in one word: accurate. Accuracy starts with getting the right individuals or busi­nesses on the list – those who have an established interest in your product or service, or those who share the same demographic char­acteristics. Gender, age, income, level of education and geographic proximity are all examples of shared demographic characteristics. Another measure of accuracy is the quality of each address. The individual or business name must be complete and correctly spelled; the street address must contain all necessary elements, including secondary information (i.e., unit, apartment, space, etc.) and street suffix (i.e., street, avenue, boulevard, road, drive, way, lane, etc. ); and the city and state must have the correct ZIP or postal code. An effective list has a data field for every unique element in the mailing list, even if it occurs rarely. List managers develop data entry conventions such as using standard abbreviations for street type (St., Ave., Blvd., etc.) and secondary address elements (Ste., #, Sp., etc. ), and enforce the standards by not allowing creative data entry (such as entering a company name in the place reserved for the name of a person). Maintaining data quality is a function of how the mail list is structured and how fully data entry standards are developed and enforced. It is particularly important that the list have the right number of fields to contain all the name and address information, and to size the fields so there is enough room to hold the informa­tion without extensive use of abbreviations or truncating. The first step in structuring a mail list is to determine the total number of unique data elements and to create a seperate field for each one, no matter how infrequently it occurs. For example, if your mailing list contains just one foreign address, you will need to create a country field as well as any additional fields required by the country’s postal system (i.e., addresses in Puerto Rico require an urbanization code). If you want to include a middle initial for an indi­vidual’s name, you will need a middle name field and refrain from entering the middle initial into the fields reserved for first name or last name. Similarly, a list that contains both individual and business names will need a company field so that the business name isn’t entered into a field used for the individual’s name. The importance of maintaining separate fields for name elements in a mail list becomes clear when searching for dupli­cates in the list. If an individual’s name is separated into its constituent parts in a mailing list, it is must simpler to identify duplicates than if the first name and last name are in the same field. Since a mail list is really a data base of ele­ments needed to form an address, it is best to maintain it in a software program such as Microsoft Access that is designed for data base management. While it is easy to use the spreadsheet program Microsoft Excel to set up columns and tabular displays, it is not the first choice for mail list mainte­nance. Don’t use Microsoft Word for your mail list even though it has a mail merge function. Merge/purge is one method of improving the quality of a mail list. In this process, two or more different name and address files are combined (merged) into one list and duplicate records are identified and deleted (purged). De-duplication (de-dupe) is the same process but using only one list. One of the main benefits of merge/purge and de-duplication is to ensure that a single individual or business receives only one mail piece. Identifying duplicates requires a set of rules to define what constitutes a duplicate. Addresses can be compared to addresses only; or names to names only; or names and addresses compared. Matches can be exact (meaning every element is identi­cal) or near (meaning Bob Peterson or Rob Peterson would be considered a match to Robert Peterson). We are a very mobile population. The U.S. Census Bureau reports that on average, about 1 in 6 Americans move every year. However, some demographic segments move more often – about one-third of rent­ers move each year, compared to about 10% of homeowners, and about one-third of adults in their early 20s. What this means for you as a mail list manager is the importance of verifying that an individual or business is at the address you have on file. One way to do this is to mail at least every 90 days and to use an ancillary service endorsement (ASE) on the outside of the mail piece. The ASE tells the USPS what to do with the mail piece if the individual or business has moved. Another way is to compare your mail list to the data­base maintained by the USPS of individuals and businesses who have turned in change of address notices. We provide this service, called move update verification, to our customers; for more information, contact Bret Atwood at 804-226-1500 or bret@atwoodprint.com. If you have carefully compiled your mail­ing list and maintained it well, you may benefit from enhancing the list with addi­tional information besides what is required to address a mail piece. A business list can be enhanced with information such as SIC code, annual sales, and number of employees, while household income, phone, gender and other demographic information can be added to a residential list. Data append pro­duces a profile of your customers which can be used as the basis for selecting prospects that match the profile. Because your mail list can be a valuable marketing tool, it is worth the effort to compile and maintain a good one. We will be glad to discuss your plans to use your mailing list for a marketing effort, and to provide information on how to improve its quality, accuracy and recency.